Sidransky, A. J. 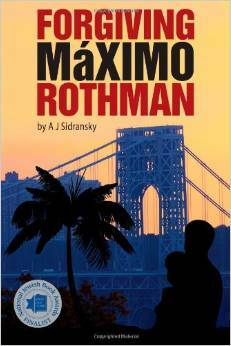 “Forgiving Maximo Rothman”, Berwick Court Publishing, 2013. When Max Redmond is found dead in his Washington Heights apartment in New York City, two men’s lives will come together even though there is a huge difference in their ages and they live continents apart. As detective Tolya Kurchenko investigates the murder, he finds Redmond’s diaries that cover forty years. He hopes that they hold the key to the murder. The novel spans sixty-five years and three continents going back to Hitler’s Germany, to the end of the Soviet Union in the 70s and to a small Jewish settlement named Sosua in the Dominican Republic to give us a novel filled with suspense as well as with people and places that are long gone. The two main ideas that I see here are bringing the news of Sosua to the world and fatherhood. To a great extent the idea of identity permeates story and this ties in beautifully with both Sosua and fatherhood as a concept. We read for basically two reasons—to be entertained and to learn something—this book not only is an exciting read but it tells about a place and people that most of knew nothing about. When Rothman is killed, his religious son Shalom comes forward. We immediately become aware of how Judaism works in his life and in the lives of his wife Rachel and their mentally disabled son, Baruch. We are immediately pulled into the plot and into the lives of the characters and through them we see how our lives are changed by the events that we face. As detective Kurchenko searches for Rothman’s murderer, he is taken from the present to the 1940s to a settlement for Jewish refugees in the Dominican Republic. He learns about the troubled relationship between the murdered father and his son, he is reminded of conflicts and loss in his own childhood. Through this, Kurchenko also must make peace with his own memories from the past. While this is indeed a murder mystery, it is much more than that and we become acutely aware of the nature of truth and how it can make us free. The characters propel the story and through them the story is told. We come to care about each character but the periods of time are also important. Sosua was an actual settlement for Jewish exiles during World War II and we get a surprising look at the between Dominicans and Jews is a revelation and the story set there is very real—so much so that I could not help but wonder why this fact of history is unknown to so many. We empathize with Rothman who had to deal with not only being a Holocaust survivor but with the loss of his family to the Nazis and the loss of a child to Trujillo in the Dominican Republic. I want to say something about Sosua because it was such a revelation for me and I have been a student of Jewish history for a long time. It was a settlement in the forests of the Dominican Republic for Jewish exiles and it gave them a chance to begin their lives anew after the horrors of Nazi Germany. Rafael Trujillo, the Dominican dictator actually sanctioned its establishment that is fascinating especially since he had ordered that Haitian refugees be slaughtered several years earlier. I suspect that his allowing for the existence of Sosua was a kind of redemption for him. Trujillo plays a part in the novel and it is fascinating how all of the stories come together to give us a read unlike anything I have had in a long time. The great news is that there is a sequel coming and I am really looking forward to it.